As I’ve note before, I came of age in a world that had become hypersensitive to the idea that some people advance only when others make unseen sacrifices for them. This got played out particularly in the area of the Vietnam era draft and student deferments, which, however one objected to the war itself, needled us with moral dilemmas. The worst thing a young man could be, in some circles, was a malingerer or even a coward. I entered the Army at age 24, having taken the draft physical three times, going from 4-F to 1-Y to 1-A. As I finished graduate school, I got my orders to report for induction Feb. 21, 1968, but for some reason I decided to “volunteer” for two years and report Feb. 7. I remember playing chess with a friend the last night before taking the bus to Richmond, and that the last classical music that I played was Haydn’s 104th (last) symphony. 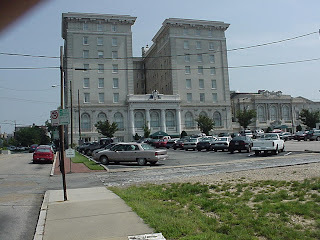 I still remember the soft landing: they put me up in the Jefferson Hotel in Richmond (long before its renovation), and I actually went to see “Valley of the Dolls” on my last night of freedom. Then after we were sworn in Thursday afternoon, we used meal tickets at the Greyhound Post house and still had a long bus ride, as civilians, to Fort Jackson. I recall our arrival at around 2 AM, our in processing, our being served mess, and actually getting to bed at about 5 AM. I look back on these Army days to remember the lesson it talked about physical fitness and the implied connection to “common obligations” that were so much a part of the moral thinking of the day. Somewhere I still have my PCPT (Physical Combat Proficiency Test) card, and I’ll take a blog picture of it when I find it, but I remember it very well. In 1968 there were five events: the low crawl, the horizontal ladder, the man carry (just a little forced intimacy there! ), the run-dodge-and-jump (replacing the grenade throw), and the mile run. I made a 190 out of 500 on the first test (300 was passing), and wound up in special training company for three weeks and getting recycled after a bout of flu (they called it “URI”). In the beginning (pun! ), I couldn’t get all the way across one sequence of 14 horizontal rungs even holding onto each rung with both hands. I called them the "friggin' bars" and in February (even in S.C.) they had been cold. By the end of Basic (it turned out to be a 14 week experience) I could do the ladders, orangutan fashion, and perhaps do 40 rungs, almost average, although not great. On my final PCPT I scored 357, and ran the mile, in combat boots, in 7:18. That’s a far cry from tenth grade when most of us almost puked after running the 440 for the first time. My legs felt strong all the time at the end of Basic, and that was a nice feeling. Then, about a year later, I guess I was still fit. In a church retreat softball came, I hit a real home run, actually over an outfield fence. At Fort Eustis, in workup softball, I was able to reach the fence on the fly a couple times. That is the best condition I was ever in. There’s a lesson in all this about physical fitness. We hear about it a lot today, as the media writes about obesity in teens. I was underweight and understrength, and had a different set of problems, which I’ll return to in a moment. The obesity seems to be community-related; people with native backgrounds, when exposed to western diets, are more likely to become obese. That’s part of it. When I was substitute teaching, what I saw was a very mixed bag. Some students were very fit. One AP student I believe could have swam with Michael Phelps in the Olympics; instead he is on a pre-med path now. But, in my world, fitness had a bearing on my ability to “pay my dues”, outside of what is monetized, for the freedoms and opportunities that I had. I don’t know exactly why I fell behind physically, but I grew up in a world where “moral” significance was attached to it. Perhaps, as I had musical ability, my brain prematurely “pruned” out coordination skills that are more commonly “expected” of my “gender” (or at least were so expected in this world). What my own bout with Army boot camp, however oppressive the idea sounds to some people today, proved is that physical conditioning, even later (I was 24) does work to some extent, and can bring physical performance almost to “normal” levels even in cases where a subtle medical explanation is likely. I can fast forward to present day and ponder some other startling observations. From the 1960s to well into the 1990s, we developed an enriched view of personal privacy and personal choice (or “individual sovereignty”), with particular emphasis on the idea that intimacy among adults always comes with consent which, however, once given may entail certain lifelong responsibilities (such as happen when one has children). (The end of the draft, which I just talked about, comports with this trend.) Since the 1990s, a somewhat flipside view has been growing back. Because of the Internet (and particularly social networking), lives are much more “transparent” and “apparent” publicly than they used to be. The generally more flexible attitude toward gender and sexual orientation certainly softens the “blow” somewhat as privacy is in some sense otherwise compromised. (Daniel Solove covered this process in his book “Understanding Privacy” (reviewed on my books blog Nov. 5, 2008). But what we are also finding is the return of a more nuanced view of family responsibility, partly associated with demographics -- longer life spans and retirements and fewer children. Once people (like me) put themselves out publicly as having some effect with what they say or with their “work” (and one could say this about composers and musicians or even actors as well as writers), there is, it seems now, some expectation that they ought to be accountable to others. That gets to be a bit complex. It means some openness to intimacy and “change” in oneself (responsiveness with a less critical attitude surrounding a particular personal interaction) as necessary responsibility of being part of a civilization or community. Some might include willingness to identify oneself with the community or greater good. Society has an interest, not only in people keeping their promises, but in people’s being willing to make the promises in the first place – to remain intimate even when times get tough for other people (marital partners or different significant others). In my own case, it seems that, if I take advantage of "free entry" to make public criticism of "things", certain others expect certain kinds of attention as the alternative cost of my entry. (You really see this in the soap operas, as with the good old "Gatsby/Nick Fallon Problem".) Some of the bizarre calls I got for manipulative sales or "role modeling" jobs (and some of them turned out to be connected to the financial collapse) seemed motivated by the desire of others to see me help them feel better about themselves. Without that willingness to accept some socialization on others' terms, personal commitment backslides under any pressure and becomes vulnerable to totalitarianism, particularly dangerous in this age of asymmetry. Picture: Jefferson Hotel in Richmond VA: my last night of “freedom” on Feb. 7, 1968.